We ship to the following states: AZ, CA, CO, D.C., FL, GA, ID, IL, IA,KS, MA, MD, MI, MN, MO, NV, NH, NM, NY, NC, OR, TN, TX, VA, WA, WI, and WY. Fresh fruit aromas of yellow delicious apple and citrus flower nuanced with tropical notes in the nose. SPARKLING SWEEPSTAKES WINNER - 2018 San Francisco Chronicle Wine Competition! Citrus, pear and floral aromas with a hint of yeast. The fine mousse brings forth the light citrus, smooth and round in the mouth. Finish is round, with a note of grapefruit. A blend of Chardonnay, Pinot Noir and Pinot Meunier. Ripe strawberry with a hint of cream and spice. The mouth is round, with a creaminess from the fine mousse. The bright, fresh fruit is followed to the finish-crisp and clean. Blend of Pinot Noir and Chardonnay. Beautiful green apple and tropical notes in the aroma follows through in the mouth with a smooth fine mousse. This wine finishes with refreshing, lingering light tropical flavors that beg for another sip. 100% Chardonnay. 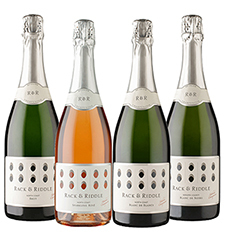 One bottle each of Rack & Riddle's award-winning, méthode champenoise sparkling wines: Brut, Rosé, Blanc de Blancs and Blanc de Noirs. SPECIAL: Shipping is INCLUDED on any purchase of a 4-pack! This wine has fine bubbles in the glass forming a perfect mousse. Aromas of brioche and spiced apples that reminds one of fresh baked apple tart.